My name is Sawanna Lucas and I am an alumni of Corryville Catholic and the proud parent of three boys who all attended or are attending Catholic schools, thanks to support from CISE. All three started Corryville Catholic in Pre-school. My oldest son, Ishmael, graduated from St. Xavier High School and is currently finishing up his last year at Miami. My middle son, William, is currently a junior at St. Xavier high school. My youngest, Dawann, is in 6th grade at Corryville Catholic. Had respect for me (their mother), their teachers, other adults in their lives instilled in them. Had the knowledge, intellect and the ability to make the right decisions every day. I attended Catholic schools and feel that I received the best education, discipline, structure, and foundation available within the community in which I lived. I wanted the same for my children. I am so grateful that they are receiving their education at Corryville Catholic. At school, my sons’ daily education complements what I teach them at home. I also know from experience that Corryville is an extension of home and the teachers work with me for the greater good of my boys. CISE has been a blessing to my family in more ways than one. CISE has made it possible for all three of my boys to receive what I believe is the best education while allowing me the opportunity to be the mom I need to be to help them become well rounded, self-sufficient and in a position to one day be able to bless someone as they have been blessed. Without CISE I would have had to work multiple jobs. This would have limited the time I had to spend with my children. I’m so grateful that I have had the time to be present to my children at home. 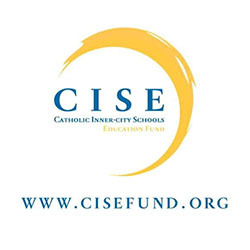 It’s not just about the financial support of CISE. They also provide praise, encouragement and challenge. The donors and staff at CISE really do care about the growth and success of my children and all the children served by the CISE schools. In my experience, CISE donors have also been mentors. This exposes my children to opportunities and experiences that I cannot provide for them, giving them different and higher goals to work toward. In my mind, the CISE donors have an impact that is immediate and beneficial; however, the long-range benefits are everlasting and priceless. CISE is the gift that keeps on giving!